Libros de medicina en pdf. Positive Darier sign on a child’s back. Slight improvement of skin symptoms, reflected by decrease of SCORing MAstocytosis Index, with decline in serum tryptase levels is the typical course in patients with diffuse cutaneous mastocytosis. Systemic mastocytosis may occur more frequently in diffuse cutaneous mastocytosis patients. Patients with adult or adolescent-onset urticaria pigmentosa are more likely to have persistent disease and are at greater risk for systemic involvement. Juvenile-onset systemic mastocytosis has a malignant transformation rate as high as 7%, whereas adult-onset systemic mastocytosis has a malignant transformation rate as high as 30%. Mastocytosis patients may present with cutaneous lesions, systemic symptoms of an acute nature, and/or chronic systemic symptoms. Most patients have pruritic cutaneous lesions. Some patients, especially those with extensive cutaneous disease, experience acute systemic symptoms exacerbated by certain activities or ingestion of certain drugs or foods. Possible systemic symptoms include flushing, headache, dyspnea, wheezing, rhinorrhea, nausea, vomiting, diarrhea, and syncope. Patients also may have chronic systemic symptoms involving various organ systems. Involvement of the skeletal system may be manifested as bone pain or the new onset of a fracture. Long-term exposure to heparin and stem cell factor from degranulated mast cells is believed to put patients at risk for osteoporosis. Involvement of the central nervous system may produce neuropsychiatric symptoms, as well as nonspecific changes such as malaise and irritability. GI involvement may yield weight loss, diarrhea, nausea/vomiting, and abdominal cramps. Cardiovascular effects can include shock, syncope (resulting from vascular dilatation), or angina. 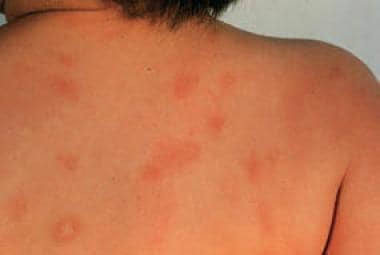 Anaphylactic reactions to hymenoptera stings may be the first sign of mastocytosis. The most common physical findings in mastocytosis involve the skin, liver, spleen, and cardiovascular system. 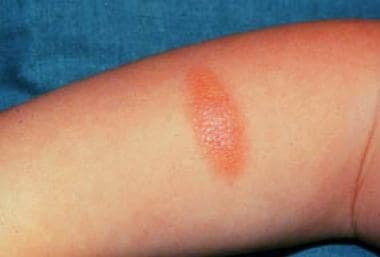 Darier sign: Wheal and surrounding erythema develop in a lesion after rubbing it. Dermatographism: In approximately half the patients, stroking macroscopically uninvolved skin produces dermographia. Flushing: Flushing may occur spontaneously following skin stroke or after ingesting a mast cell degranulating agent. 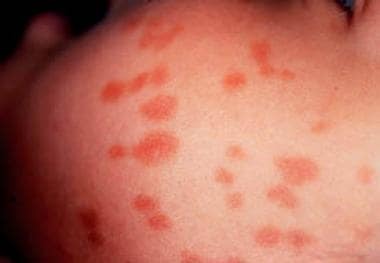 Diffuse cutaneous mastocytosis (DCM): This is rare and is characterized by mast cell infiltration of the entire skin. Other: Large hemorrhagic bullous and infiltrative small vesicular variants occur. Blistering predominates in infancy, whereas grain-leather appearance of the skin and pseudoxanthomatous presentation develop with time. Anaphylactic shock may occur. Liver findings include possible hepatomegaly, which is present in 40% of adult patients with systemic mastocytosis. Spleen findings include possible splenomegaly, which is present in 50% of patients with systemic mastocytosis. Cardiovascular findings include hypotension and tachycardia. CBC count: In systemic mastocytosis, CBC counts may reveal anemia, thrombocytopenia, thrombocytosis, leukocytosis, and eosinophilia. Plasma or urinary histamine level: Patients with extensive cutaneous lesions may have 24-hour urine histamine excretion at 2-3 times the normal level. Multifocal dense infiltrates of mast cells (>15 close to each other) observed in bone marrow biopsy specimens and/or mast cells stained for tryptase in biopsy specimens from other extracutaneous organs. Obtain a bone scan and radiologic survey in nonpediatric patients or if the CBC count is abnormal in a young child. If a patient has skeletal system symptoms, perform a bone scan and radiologic survey to identify lytic bone lesions, osteoporosis, or osteosclerosis. If a patient has GI symptoms, order a GI workup to identify peptic ulcers, abnormal mucosal patterns, or motility disturbances. If a diagnosis of mastocytosis is uncertain, tests for elevated mast cell mediators and degradation products may help establish the diagnosis. Tryptase levels are elevated in patients with mastocytosis. Tryptase levels may be more useful than histamine levels, because histamine can be elevated in hypereosinophilic states. Urinary NMH and N-methylimidazoleacetic acid levels [30, 31] may be more specific and sensitive than urinary histamine levels. NMH levels correlate directly with the extent of skin lesions. NMH levels decrease with age; therefore, consider the patient’s age when interpreting results. Even during asymptomatic periods, urinary prostaglandin D2 metabolites levels may range from 1.5-150 times higher than normal levels. This test is not widely available. Perform bone marrow biopsy and aspirate in patients with urticaria pigmentosa if they have peripheral blood test abnormalities, hepatomegaly, splenomegaly, or lymphadenopathy to determine if they have an associated hematologic disorder. Inject an anesthetic agent without epinephrine adjacent to, not directly into, the lesion chosen as the biopsy specimen to avoid mast cell degranulation, which makes histologic examination difficult. Examination reveals dermal mast cell infiltrates, especially in the papillary dermis around blood vessels (see image below). 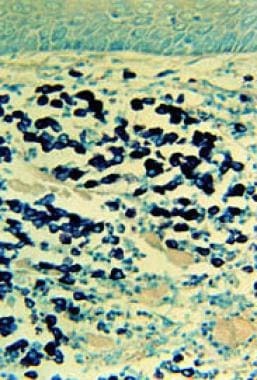 Diagnosis of urticaria pigmentosa may require demonstration of mast cell granules using Giemsa stain (see image below) or toluidine blue stain. The Leder stain is not dependent on intact mast cell granules. 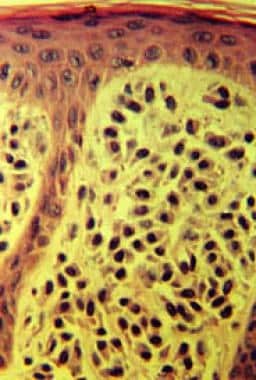 Mast cell nuclei are round with surrounding ample cytoplasm producing a “fried egg” appearance. The typical presentation of mast cells is a single nuclei, yet there have also been atypical histological findings reported in four patients with uriticaria pigmentosa that showed mast cells with bilobed and multilobed morphology. In telangiectasia macularis eruptiva perstans (TMEP), mast cells are brick shaped or spindle shaped. In nodular urticaria pigmentosa, mast cells are observed in dense aggregates and may extend through the entire dermis and into subcutaneous tissue. If the lesion from which the biopsy specimen was taken was traumatized during harvest, edema and eosinophil infiltrates may be present. 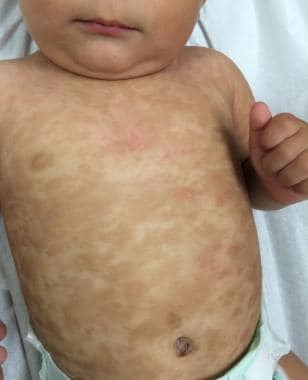 The hyperpigmentation of cutaneous mastocytosis is secondary to increased melanin in the basal cell layer and melanophages in the upper dermis. Planar xanthoma has been described in association with mastocytomas. Therapy is conservative and aimed at symptom relief because the prognosis for most patients with cutaneous mastocytosis (CM) is excellent. None of the currently available therapeutic measures induces permanent involution of cutaneous or visceral lesions. Advise patients to avoid agents that precipitate mediator release, such as aspirin, nonsteroidal anti-inflammatory drugs, codeine, morphine, alcohol, thiamine, quinine, opiates, gallamine, decamethonium, procaine, radiographic dyes, dextran, polymyxin B, scopolamine, and D-tubocurarine. H1 and H2 antihistamines decrease pruritus, flushing, and GI symptoms. Oral disodium cromoglycate may ameliorate cutaneous symptoms, such as pruritus, whealing, and flushing, as well as systemic symptoms, such as diarrhea, abdominal pain, bone pain, and disorders of cognitive function. Cautious administration of aspirin to inhibit prostaglandin synthesis and maintain mast cell degranulation may be beneficial for patients with disease resistant to H1 and H2 antagonist therapy alone. The patient, premedicated with H1 and H2 antihistamines, may be started on small doses of aspirin, slowly titrated to reach a plasma level of 20-30 mg/100 mL. Initiate this treatment regimen in a controlled environment, because aspirin can induce mast cell mediator release and subsequent cardiovascular collapse. 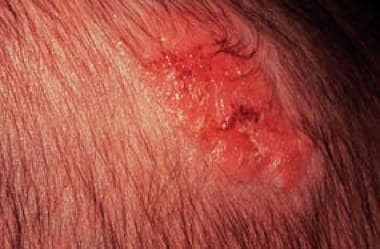 Cutaneous lesions that involve a limited body area may be treated with a potent class 1 topical corticosteroid, with occlusion if required. Intralesional injections of small amounts of dilute corticosteroids may resolve skin lesions temporarily or indefinitely. The risk of skin atrophy and adrenocortical suppression resulting from the treatment is minimized by treating limited body areas during a single treatment session. Systemic corticosteroids are useful only in specific situations, such as ascites, malabsorption, and severe skin disease. Case reports have described complete remission of bullous mastocytosis with oral corticosteroids,  but systemic therapy is often disappointing because the primary mode of action of corticosteroids is redistribution rather than death of mast cells. Medical alert bracelets should be made available, and an epinephrine self-injector demonstration should be performed and self-injector prescribed for patients with systemic mastocytosis or patients with episodes of vascular collapse. Patients with recurrent episodes of vascular collapse may be prophylactically placed on H1 and H2 antihistamines to lessen the severity of attacks. Episodes of vascular collapse may be spontaneous but have also occurred after stings from insects or after administration of iodinated contrast media for imaging studies. Premedication with antihistamines and corticosteroids is recommended before such procedures in patients at risk. Emergency resuscitation or hospitalization may be required for severe syncope or hypotensive shock resulting from the sudden severe degranulation of many mast cells. 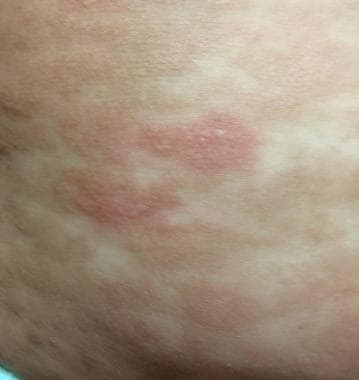 Advise cutaneous mastocytosis patients to avoid certain physical stimuli, including emotional stress, temperature extremes, physical exertion, bacterial toxins, envenomation by insects to which the patient is allergic, and rubbing, scratching, or traumatizing the lesions of cutaneous mastocytosis. Tailor therapy according to the patient’s specific needs for symptomatic relief. 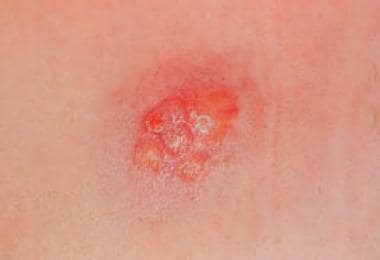 Patients may be started on oral H1 antihistamine and/or oral disodium cromoglycate with or without the use of a potent topical steroid for selected cutaneous lesions. In patients with a limited number of lesions, intralesional corticosteroid injections are an additional therapeutic option. Oral histamine H2 antagonists may be administered in addition to an oral H1 antihistamine. Antihistamines relieve pruritus and flushing. Hydroxyzine antagonizes H1 receptors in the periphery. It may suppress histamine activity in the subcortical region of the CNS. Cromolyn is a mast cell stabilizer that improves diarrhea, flushing, headaches, vomiting, urticaria, abdominal pain, nausea, and itching in some patients. Cromolyn sodium inhibits degranulation of sensitized mast cells following exposure to specific antigens. It is available as an oral concentrate solution in 5-mL ampules to mix with water and is administered at least 30 minutes before eating. Each 5-mL ampule contains 100 mg of cromolyn sodium, USP, in purified water. Each foil pouch contains 8 ampules. The addition of H2 antagonist to H1 antagonist helps control pruritus and whealing. In addition, GI symptoms associated with hyperchlorhydria, such as peptic ulcer disease and gastritis, respond well to this medication. Cimetidine is an H2 antagonist that when combined with an H1 type may be useful in treating itching and flushing in urticaria and contact dermatitis that do not respond to H1 antagonists alone. Use cimetidine in addition to H1 antihistamines. Vasopressors are for patients with systemic disease or extensive symptoms. Epinephrine is the drug of choice for treating anaphylactoid reactions. It has alpha-agonist effects that include increased peripheral vascular resistance, reversed peripheral vasodilatation, systemic hypotension, and vascular permeability. Its beta-agonist effects include bronchodilatation, chronotropic cardiac activity, and positive inotropic effects. Esta publicação foi postada em artigos médicos, dermatologia, farmácia, Imunologia, medicina, nutrição, PEDIATRIA e marcada hymenoptera stings, Mastocytosis, urticaria pigmentosa. Cirurgia bariátrica é uma opção terapêutica segura? #Há uma relação direta entre a #Depressão e a #Ansiedade?